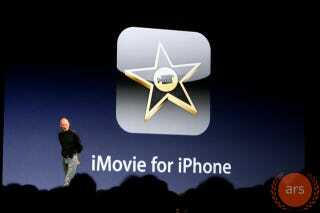 Along with HD video recording, the iPhone 4 is getting a way to edit it right on the phone itself: iMovie for iPhone. Obviously, it's pretty basic video editing, as its on a phone. But you're able to combine various clips, add music, photos, titles and transitions as well as basic effects. You'll recognize the effects from the desktop version of iMovie, where you're able to do stuff like add the "Ken Burns Effect" with slow-mo zooming and panning.